Community hall or bhoot bungalow? CHENNAI: Standing before the dilapidated structure on 13th Extension Street in a wealthy, residential neighbourhood of Nandanam, it is difficult to believe that the concrete skeletal remains are all that is left of a once-thriving community hall – witness to many historic political and social gatherings – now an eyesore, environmental hazard and den for anti-social elements. The peeling walls, dirty interiors, broken furniture, over-grown bushes, overflowing garbage, broken walls and mangled gates tell a shocking story of long-standing apathy and neglect, raising questions how the successive state governments could have turned a blind eye to a prime piece of land, located in the heart of the city, and allowed it to fall into ruin. Today, the abandoned structure looks more like a bhoot bungla, haunted by memories of its golden past. 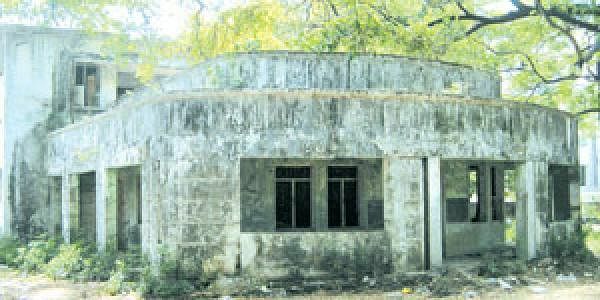 No less a character than Chief Minister K Kamaraj laid the foundation for the community hall in 1961, when a non-gazetted Government Officers Colony (NGGO), built at a cost of `22 lakh, sprang up in the local area. The barely visible inscription on the granite plaque, proclaiming that the hall was built through government patronage, bears the veteran Congress leader’s name and that of his housing minister R Venkatraman. On completion in 1964, the hall stood on about four grounds of land belonging to the Tamil Nadu Housing Board. “It came as a boon to local residents, who could rent the hall at economical rates to hold meetings and functions,” K N A Mohammad Lyoob, President of the NGGO Colony Association told City Express. An ace director also used the hall to picturise a hit song in his Tamil movie. Remember Kamal Haasan standing atop the stage singing Kadavul amaithu vaitha medai in Aval Oru Thodarkathai at the wedding of the heroine’s sister? “Director K Balachander filmed the song in our community hall,” Anuradha recalled with nostalgia. All of this is in the past. Fingers point at the Tamil Nadu Housing Board for lack of maintenance, which has left the hall in a terrible state of neglect and disuse for the past 15 years. “We sent several petitions to the government and the TNHB in 2006, seeking reconstruction of the hall,” claimed Lyoob, who was joint secretary in the finance department. But all efforts were in vain before an unresponsive officialdom. The association’s argument is that the new government must immediately direct the TNHB to clear the land and reconstruct the hall. “The Board keeps citing lack of funds for reconstruction, which is unacceptable,” Lyoob said. “It can build any additional complex for generation of revenue,” he pointed out. Some residents said that a recreation park would also be welcome. What is a matter of concern is that this seedy-looking place is a den for anti-social elements in the night. “With the police booth empty most of the time and a dip in night patrolling, the structure is a haven for lawbreakers,” Lyoob claimed. “Turned into a garbage dumpyard, it has also become a mosquito breeding ground,” he added.